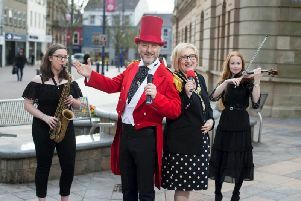 A series of productions focusing on Derry are to be staged over the coming months at the Playhouse. The theatre’s February to May programme starts this weekend with a young local cast performing a challenging new Irish drama, which is Derry’s contribution to London’s National Theatre Connections project. ‘Hospital Food’ written by Eugene O’Hare and produced by More Pies Productions, is set in a special room where teenagers with cancer can meet, and will be staged on Thursday 12th and Friday 13th February. A new play about The Siege of Derry, ‘Walking to the Ark’ by Carlo Gebler will be staged in St Columb’s Cathedral in May. The new piece is part of The Playhouse’s City of Culture legacy programme. Two special events will also be held in memory of local historian and writer Annesley Malley in St Columb’s Cathedral on International Women’s Day on March 8th and at The Playhouse on May 16th. For more info got to: www.derryplayhouse.co.uk.